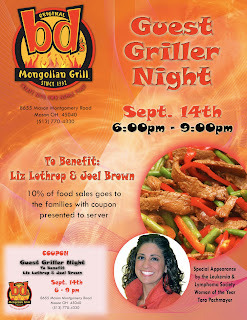 Mark your calendars for the bd's Mongolian Grill fundraiser to benefit Liz Lothrop & Joel Brown. Their treatment is still going strong and both seem to be doing great! Both have at least another year to go in treatment. bd's has agreed to donate 10% of food sales on September 14th from 6pm - 9pm to these great families! Come on out and join us! Please print the flyer to give to your server.